The outgoing US Ambassador to Ghana, Her Excellency Pamela E. Bridgewater, says she has been facing the same challenges that Ghanaians have been facing, during her three year duty stay in the country. According to Bridgewater, she was not exempted from the disturbing effects of power outages, short in water supply, and the flooding incidence in the country. The Ambassador disclosed that during her three year stay, she observed that Ghanaians had no respect for time, but added that that attitude was gradually changing for the better. Bridgewater made the observation, when she paid courtesy on the Brong-Ahafo Regional Minister, Ignatius Baffour Awuah, in Sunyani, as part of her two-day working visit to the region, to bid the people farewell. Her Excellency disclosed that the visit was to share ideas about the region, and strengthen the cordial relationship, between Ghana and the United States of America, for future development. Her Excellency Bridgewater expressed her happiness, when the Regional Director of Health Services, Alhaji Dr. Mohammed Bin Ibrahim, disclosed that Guineaworm infestation cases, as at the year 2007, in the region was 42, and hoped that after few years guineaworm would be eradicated totally from the country. She was also pleased, when Dr. Bin Ibrahim stated that Brong-Ahafo would in five years be a net exporter of nurses, as the collaboration between the Ghana Health Service and the the Brong-Ahafo Regional Coordinating Council, had established more health education institutions. Her Excellency Bridgewater gave the assurance that the American Embassy would continue supporting the Ghana Health Service, to help eradicate Guineaworm and reduce the prevalence of malaria in the country. Mr. Baffour Awuah, on his part, noted that the relationship between the Embassy and the region had been cordial, ever since Her Excellency assumed office in Ghana, and wished that the cordiality would be sustained. According to the Minister, the region was a major food producer in the country, since 60% of the population was into agriculture. He however noted that modernization in agriculture still remained a problem. Mr. Awuah commended the America for its high credentials, when it came to democracy, saying Ghana looked forward to emulating her. He, however, lamented about the high rate of school dropouts in the country, which could affect Ghana's democracy in the long run. He stated that technical education in the region was inadequate, and called for a partnership with the Americans, to establish technical education institutes in the region. 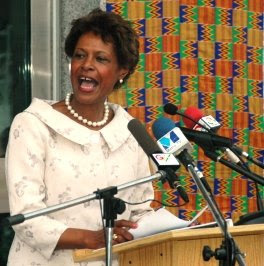 The Ambassador and her entourage, later visited Berekum to ascertain the progress of work on Self Help Projects, and the construction of a Rehabilitation Center for the Physically Challenged, which was sponsored with an amount of $3,000 from the Special Self Help Program, instituted by the American Embassy. According to the Coordinator of the Special Self Help Programe, Peace Adwoa Nunoo, the Ambassador would also present the leader of the Berekum Association of the Physically Challenged, Mr. Samuel Amfo Abankwa, with a motorized wheelchair. She disclosed that the Embassy had been releasing an amount of US$70,000 annually, for the whole country, for the past three years, to support the less-endowed in society.